Posted By:Unknown | At:1:03 PM Be the first to comment! 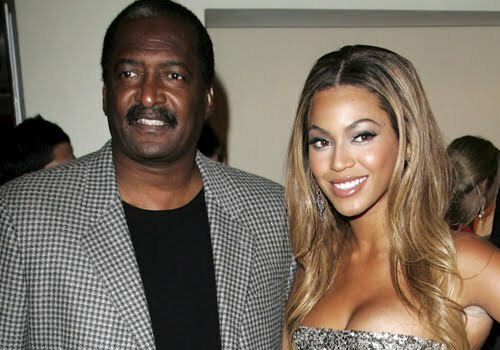 The legal papers filed this week by Mathew Knowles, Beyonce's father and former manager, state that Live Nation Entertainment made false claims about him to his daughter - including that he "stole or took money from her" - at least in part in an effort to secure the rights to her 2011 world tour. But they also may shed light on new developments in the singer's career and business, and additional information that has been requested could provide even more. The documents, which are available to the public, claim that Live Nation executive Faisel Duranni is serving as the president of Beyonce's management company, Parkwood Entertainment; that Live Nation has been successful in its effort to procure rights to a Beyonce world tour and recently paid her $4 million for unspecified reasons; and that "representatives of Live Nation suggested to Beyonce or her representatives that [Mathew Knowles] had conspired with one Al Haymon to defraud Beyonce." However it plays out, Knowles seems to have opened a can of worms, putting the touring and management rights-and the career-of one of the most popular artists in the world under scrutiny. The move will also bring scrutiny to Knowles' reputation and credibility as a manager and music business executive, though apparently this is a chance he is willing to take in attempting to bring this information to light. The papers state that in October of 2010, independent law firm Reed Smith did an audit on behalf of Beyonce, and allege that, based on false statements to the firm from Live Nation representatives, informed Beyonce that Knowles "stole or took money" from the star, and accused Knowles of defrauding Beyonce. She terminated her management agreement with her father on May 13 of this year, they say. According to the papers, Duranni, a key member of Live Nation CEO Michael Rapino's executive team, now serves as president of Beyonce's new management company. Among his titles at Live Nation, Duranni is president of artist marketing products, and he is regarded as one of the key facilitators in orchestrating the Live Nation multi-rights deal with Jay-Z, Beyonce's husband. Given Duranni's association with Jay-Z, it's not a stretch that he would work with Beyonce. The papers state that while Knowles was Beyonce's manager, Live Nation unsuccessfully attempted to gain the rights to her world tour, and that prior to May 2011, Live Nation possessed only the rights to her North American tour. Though nothing has been confirmed, if Live Nation has indeed procured the rights to promote a world tour by Beyonce, it would make sense that the tour would be steered by Live Nation's Global Touring team, which is currently helming the record-setting U2 "360" tour and also produces tours by Madonna, Lady Gaga and others. The box-office stakes for a world tour by Beyonce are in the hundreds of millions of dollars, depending on how much the artist works. However, while negotiations are underway, it is not clear whether a tour deal has yet been signed, and no touring time period has been established; any tour would have to work around Beyonce's other commitments, including a film, sources say. It is worth noting that a truly global tour not only takes months of planning, but as long as a year or more to execute. As for the $4 million payment, the papers speculate the fee could "perhaps [be] a settlement of claims between Live Nation and Beyonce." That's a big "perhaps," however: superstar artists routinely take in such sums from promoters, whether they are payments based on percentages of dates already played or advances on future tours, or in the case of a multi-faceted company such as Live Nation, such fees could relate to VIP ticketing, merchandising, branding, or any number of other revenue streams. Live Nation did not report any box office data on Beyonce to Billboard Boxscore in 2010, but five shows in Brazil promoted by Evenpro/Water Brother grossed $12.3 million. In 2009, Beyonce reported $73.3 million from 68 shows, with attendance close to 850,000, to Boxscore. Those shows were promoted by Live Nation, AEG Live and other promoters. Finally, the allegation that Knowles conspired with Haymon to defraud Beyonce is striking, to say the least. One of the most successful R&B promoters of all time, Haymon has a relationship with Live Nation dating back to the early days of concert-promoter consolidation. Under the SFX banner, Live Nation's previous incarnation acquired 51% of Al Haymon Enterprises in 1999, then made it a controlling interest in 2008, and in April of 2010 acquired the remaining 49% interest, according to SEC filings. Haymon has been active as a promoter within the Live Nation family, listed as co-promoter on Jay-Z tours and recently on Lil Wayne's "I Am Still Music" tour. The reclusive promoter rarely gives interviews and has always operated away from the spotlight, but according to sources, Haymon is still actively part of the Live Nation network of promoters. Thus, in effect, Knowles is saying Live Nation accused one of its own promoters of conspiring with Knowles in the alleged misdealings. Beyonce is one of the elite touring artists in the business, with a global upside that makes her an extremely attractive touring property. As a management client, the stakes are even higher: She offers a diverse and lucrative career, with recording - including the no. 1 album in the country -- licensing, merchandising, branding, fashion, television, film, and other endeavors, all of which are either more than viable or trending upward and seem more than likely to do so for years to come. It is not difficult to see why a battle over her touring and management could become contentious. Live Nation and Knowles declined Billboard's requests for comment; Duranni had not responded to an e-mail from Billboard requesting comment.